So, I have the best boyfriend ever for two reasons. First of all, he puts up with me when I am at my worst which is something only someone who loves me would do. Secondly, he not only listened to me talk about the blog for three hours one day, but he came up with a fun idea of his own- “Accessory Thursdays”. Some Thursdays I’ll be posting accessories for that week’s paper doll. One thing, he noticed was most of my paper dolls had cool accessories . So, he thought I should post them all on one day. I’m not promising every week will have an Accessory Thursday, but here is the first of this new tradition. In this paper doll prom related accessory set, we have a three pairs of strappy high heels to go with any of the dresses. 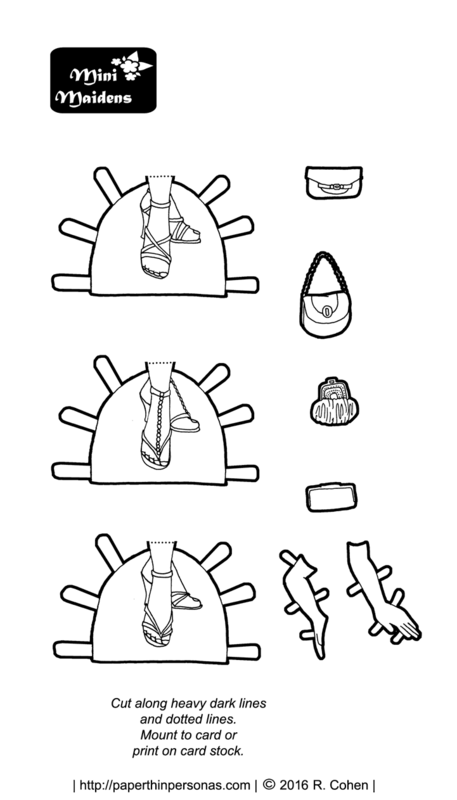 I don’t think it comes to a shock to ANY of my readers that I like to draw paper doll shoes. After all, I kinda have a thing for shoes. Meanwhile, she also has four different handbags, since any girl needs her cellphone, lipstick, and a flask to spike the punch. Where else is she going to put all that? Lastly, I added in a pair of long gloves. I just think gloves are so darn elegant, though I have never worn a pair. Tomorrow, there will be a round-up of all the posts this week and then, of course, another dress. So that’ll end the first week of this new format. I’d love to hear what people have enjoyed or not enjoyed so far, if you like to support PTP, than consider becoming a patron. These are beautiful! This whole week has been so fun. I love both the single sheets and the weekly themes… the weekly themes are such a cool concept. Thank you! Can’t wait for tomorrow and eager for next week’s round.